Flattened chicken to 1/2-inch thickness. Warm 1 tablespoon olive oil in a large skillet over medium-high heat. Season chicken with salt and pepper; place in skillet. Brown chicken for 5 minutes on each side. Remove chicken from skillet; keep warm. Reduce heat to medium. Warm the remaining olive oil. Add mushrooms and rosemary; cook and stir for 6-8 minutes until mushrooms are tender. Reduce heat to low. Add garlic; cook and stir 1 minute longer. Stir in the chicken broth, cream and asiago. Cook and stir until cheese is melted. 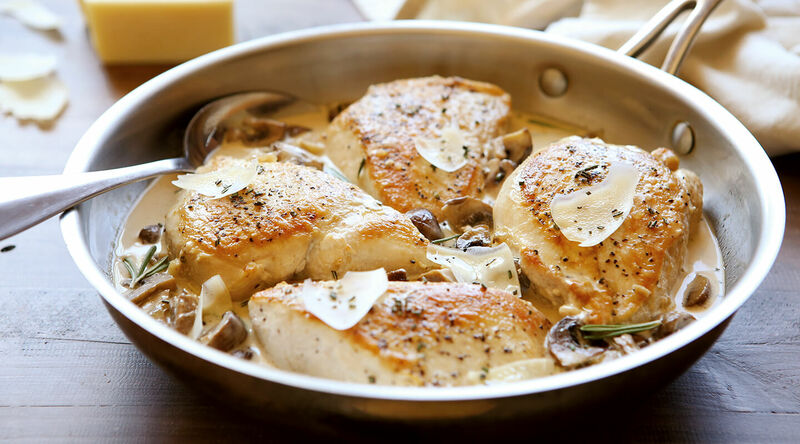 Return chicken to skillet; cook for about 10-12 minutes or until a thermometer reads 165°F, flipping chicken and stirring sauce as necessary. Adjust seasonings to taste. Garnish with shaved asiago. Note: Total carbs for serving: 4 g.